I’ve had such a hectic few months I’m now in Glasgow for the weekend, relaxing. My mind never drifts far from the croft, though. I have a sense of satisfaction this weekend, I have made progress in the right areas and I am confident that the croft is going to provide a viable income. Through the day job, I had to pop out to the dump in Stornoway, where I took the opportunity to ask a question about a subject that I’d been thinking of for a while; using old tyres as an animal shelter on the croft. My crofts are flat and offer little in terms of shelter from the wind, and this is a (hopefully) cheap way of doing it. 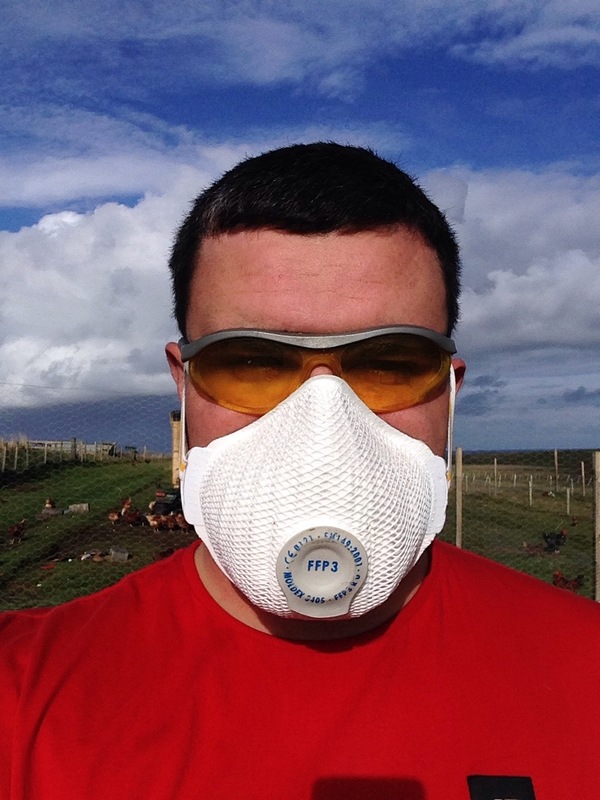 It was recommended that I contact SEPA though, as there may be an issue in terms of pollution. I did that and applied for a licence which now means I’ll be able to take old tyres from garages etc and create wind breaks with them for this winter. I’ve also been working on the efficiency of the hen house. I think I’ve got my system in place for ensuring the maximum number of eggs remain clean (I can’t sell dirty ones in shops) and now all I have to do is get my lighting situation sorted and I’m good to go! I think I have finalised my labels too, so hope to get them finished shortly. I’m on a week’s holiday from work now, so I’m getting round to sorting out all the wee jobs that I can’t get to in a normal week. 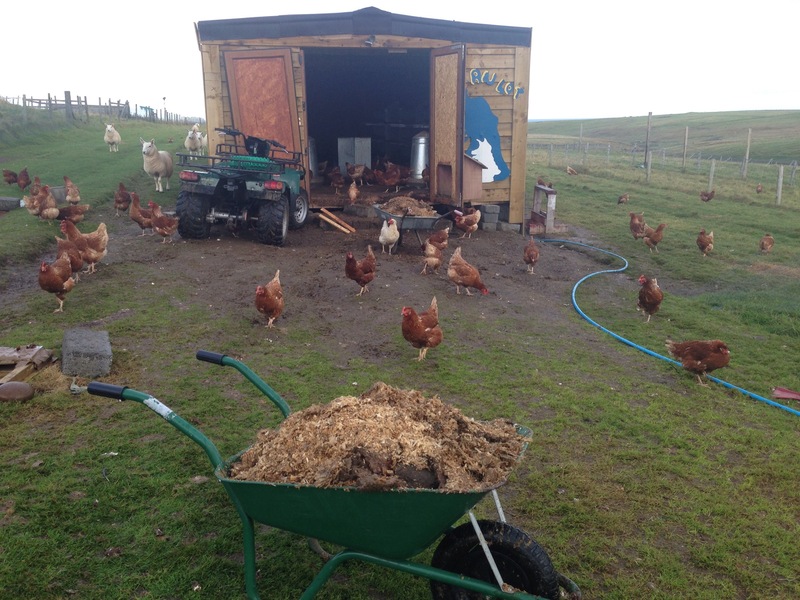 The one aspect of the hen house I have to improve is the mucking out; I spend too long moving wheelbarrowloads of it and end up reacting to the wood shavings I put down. This is how I combat it! One negative from this week was an apparent otter attack on one of my young ducks. I found it like this on Thursday night. 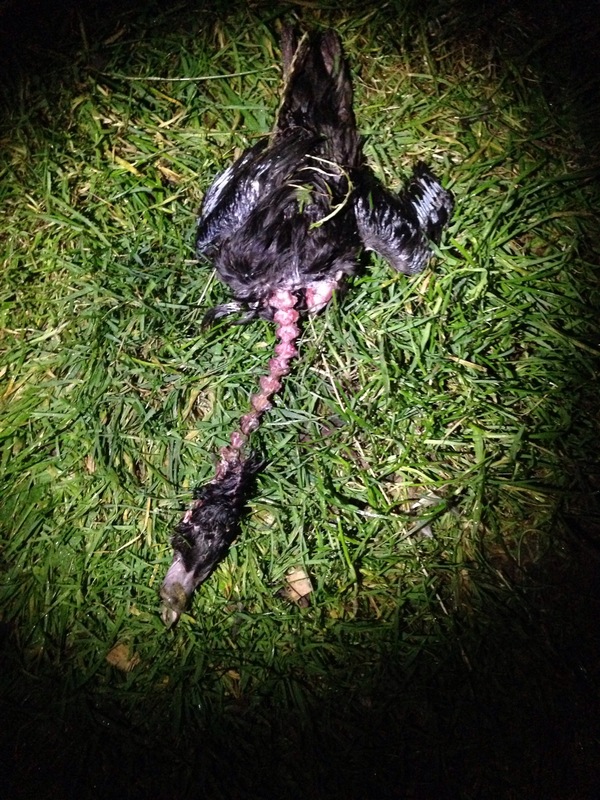 I’ve lost a couple of birds to a buzzard attack in early 2013, but never any to ground predators. I’ll perhaps have to be more vigilant now. A couple of weeks ago, I had to let my ducks out of their run, as the stagnant water was becoming a hazard for them. I have to build them a run around the stream on the croft at some point. Trying to clean out the wee pond they had just wasn’t feasible. Anyway, I let them out and off they went, enjoying life. There are 2 black ones and they disappeared very soon after getting out. I would see one most evenings, but not the other. I feared the worst until she appeared last Sunday with 9 ducklings!! I was in the kitchen and heard all this commotion outside. Bud ran to the back door too, barking, so I guessed something weird was going on. I ran outside and saw a flash of yellow to my left; ducklings! Unfortunately I was not the only one attracted by the noise. As I came out, a crow swooped down and flew off with a duckling, which was still wriggling in it’s mouth. I ran after it for a while, but it landed about 1/4 mile away. 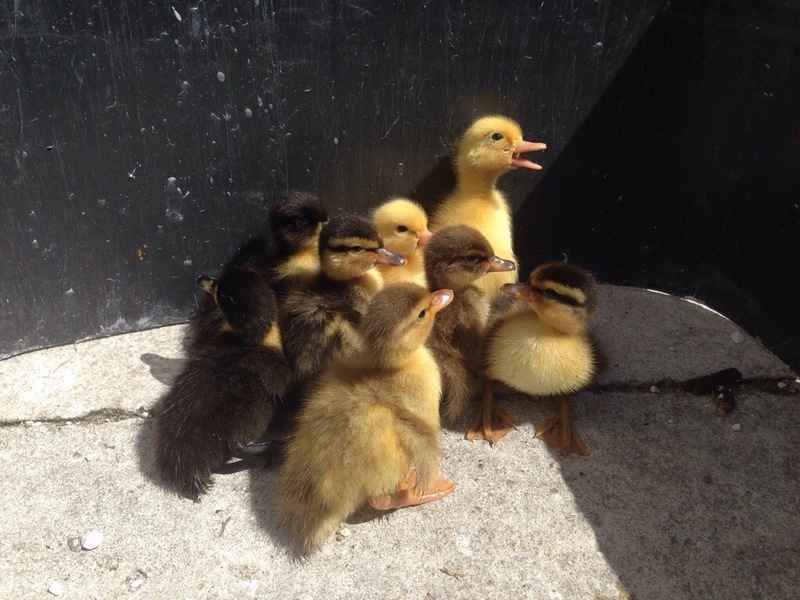 I had to make a split second decision, so I sacrificed that duckling (which would have been severely injured, probably dead, by the time I got there) to make sure that no predators got the other 8. They are so fast along the ground so it took me a wee while to get them all collected but they’re now safely in a run in the barn. 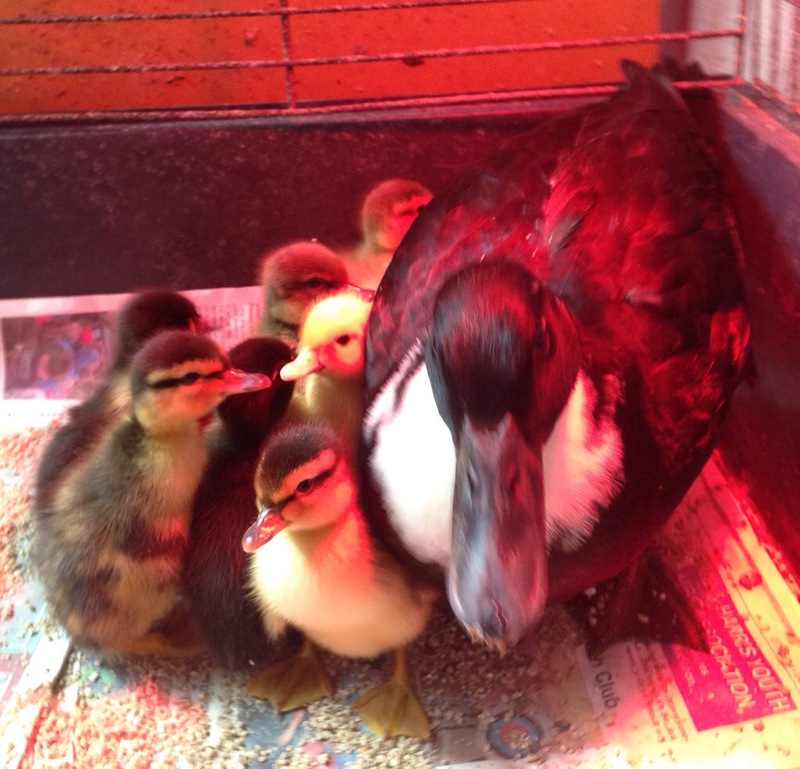 One smaller duckling died during the week, but the other 7 are doing really well. The other black duck is still out and reappearing periodically. I am convinced that she’s sitting on a nest too, so don’t be surprised if more appear!